Offering one of the strongest carrier-to- vehicle mounting assemblies available on the market, the redesigned wheel carrier assembly for the Jeep JK Wrangler is bolted to the rear bar via a heavy duty, 5.11″ long carrier hub featuring self-lubricating sintered bronze bushes. The mounting structure bolts directly onto the chassis bracket assembly for maximum strength and durability. 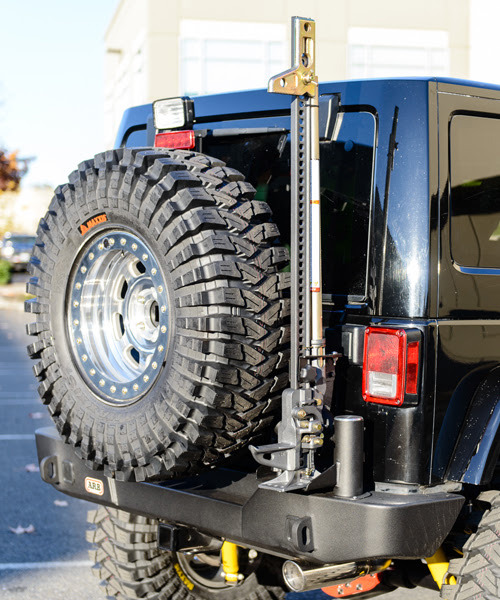 The adjustable wheel carrier mount allows for fitment of up to 40″ tires, and the Hi-Lift jack mount can be horizontally re-positioned to neatly sit next to the spare. The wheel mount plate is slide adjustable to cater for a range of wheel offsets. As with the previous design, the Jeep JK Wrangler wheel carrier swings away with the rear door, however it now employs a ball joint mounting system instead of heim joint. Once the door is closed, the wheel carrier is pressed against a polyurethane bush which reduces unwanted vibrations while still allowing the carrier to move freely with chassis rail flex during extreme off roading. The ARB rear bar recovery points also include an elongated slot so that the shackle bow can be passed through the point, allowing the shackle to pivot when pulling from slight angles. A new ball-joint mounting system has been developed by ARB for the Jeep JK Wrangler rear bumper.